The building and construction sector is responsible for about 40% of global energy consumption and associated emissions. Broken down, the industry’s contribution to air pollution is 23%, climate change 50%, drinking water pollution 40%, and landfill wastes 50%. It is for this reason that the Paris Agreement has tasked the sector with finding solutions to reduce the impact of greenhouse gas emissions. To a certain extent, the industry has answered the call, with green building projects doubling every three years. It’s projected that 60% of projects will be green by 2018. There are reasons for this trend that go beyond the desire to “do the right thing”. For construction companies with an eye on the future, the benefits of going green make solid business sense, and here’s why. In the next 12 months, the United States Environmental Protection Agency (EPA) will increase its efforts to push the green agenda by implementing and monitoring an increasing number of rules and regulations that hold the construction industry accountable for reducing its negative impact on the environment. Companies that fail to comply will find themselves faced with a grim scenario of fines and penalties, delays in production, and a potential loss of reputation and investment, depending on the severity of infringements. Those construction firms who are already turning green, are reaping rewards in the form of ‘green reputation’ with all its knock-on benefits, tax credits, and a number of EPA reward programs: Industrial Recycling, Energy Star, Environmentally Preferable Purchasing, and GreenScapes. Similarly, the Canada Green Building Council (CaGBC) is working to reduce environmental impact through project certification, advocacy, and research, as well as giving support to the industry by providing green building education to more than 30,000 professionals across the country. It’s clear that just as the EPA seeks to support and reward, it means business when it comes to cleaning up the construction sector, with an increasing number of successful prosecutions in recent years. When necessary, the agency, informed by its EPA Strategic Plan, brings a civil or criminal action against those who violate environmental laws. In 2016, the body’s annual enforcement and compliance actions resulted in $6 billion in combined federal administrative, civil judicial penalties, and criminal fines, and 93 combined years of incarceration for sentenced defendants. Without a doubt, the EPA is increasing its effort to ensure that companies that fail to comply with environmental laws will pay the cost. Civil Administrative Actions these are non-judicial enforcement actions taken by the EPA or a state under its own authority. These actions do not involve a judicial court process but can take the form of a notice of violation, a Superfund notice letter, or an order (either with or without penalties) directing an individual, a business, or other entity, to take action to become compliant or clean up a site. Civil Judicial Actions are formal lawsuits filed in court by the US Department of Justice on behalf of the EPA, or in civil cases typically filed by the State’s Attorney General on behalf of a state. They are brought against persons or entities who fail to comply with statutory or regulatory requirements. This can include failure to commit to a cleanup, or noncompliance with an administrative order to pay the EPA the cost of cleaning up a Superfund site. (A Superfund site is any land in the US that has been contaminated by hazardous waste and identified by the EPA as a candidate for cleanup because it poses a risk to human health or the environment. These sites are placed on the National Priorities List (NPL). Criminal Actions usually brought against a company or person for the most serious violations; those that are willful, or knowingly committed. A court conviction can result in fines or imprisonment. Every three years, the EPA selects National Enforcement Initiatives (NEIs) that focus resources on national environmental problems where there is notable noncompliance with laws. These initiatives are in addition to the EPA’s core enforcement work. The present cycle began on October 1, 2016, and will continue for three fiscal years. During this time the EPA will retain four of its current National Enforcement Initiatives, add two new initiatives, and expand one to include a new area of focus. Water—raw sewage, animal waste, stormwater runoff, and drinking water. Air—pollution from largest sources, toxic air pollution. Energy and climate—energy sector compliance with air, water and waste rules, GHG rule compliance. Clean communities—protecting people from exposure to hazardous chemicals. Keep in mind that when it comes to the compliance of environmental laws, the EPA delegates authority to certain states to implement regulatory programs. This means that some states may demand more stringent compliance than the federal requirements. It’s best to check with your state and local agencies before starting a construction project in a new location. The planning guide for managing your environmental responsibilities put out by the EPA Office of Compliance for the construction industry is a handy resource. GHG emissions produced by industry activities, mainly the combustion of fossil fuels, have continued to rise, contributing a whopping 21% of emissions to the national footprint. According to the EPA, the sector could reduce its emissions by around 25% if it implemented widescale upgrading, and replacement, and deployment of the best available technologies. These “new and replacement products”, based on latest technologies, are having a dramatic effect on increasing construction site activity levels while reducing GHG emissions in the sector. An example is the Northern Shield range of industrial heaters manufactured by Thermal Intelligence, the first green-certified temporary heating systems company in the world. They’ve swapped out the old technology of direct fired and indirect fired heat for next-generation flameless technology that uses ultra-efficient electromagnetic heat generation. This makes their green heating systems safer, more reliable, and better performing, while burning less than half the fuel of their closest competitor—significantly reducing GHG emissions. Energy efficiency—switch to more efficient industrial technology by, for instance, identifying manufacturers whose equipment and technology uses less energy to light and heat factories or to run equipment. Fuel switching—change to fuels that result in less CO2 emissions but deliver the same amount of energy when combusted. So, using natural gas instead of coal to run machinery. Recycling—create industrial products from recycled or renewable materials instead of producing new products from raw materials. An example is using scrap steel and scrap aluminium instead of smelting new aluminium or forging new steel. Training and awareness—educate stakeholders on ways to reduce or prevent emissions leaks from equipment. The EPA has a variety of voluntary programs that provide resources for training and other steps for reducing emissions. The EPA’s NEPAssist is a great tool to help you plan your construction project around environmental considerations, as well prepare for the environmental review process. The web-based application draws environmental data dynamically from EPA Geographic Information System databases and web services, and gives you an immediate screening of environmental assessment indicators for your particular area of interest. The tool can potentially raise important environmental issues at the earliest stages of project development, saving you considerable problems in the long run. The EPA’s Canadian counterpart is Environment and Climate Change Canada (ECCC) that upholds the Canadian Environmental Protection Act, 1999 (CEPA 1999) aimed at preventing pollution, contributing to sustainable development, and protecting the environment and human health. In order to carry out their mandate, the Environmental Enforcement Act (EEA) governs the fine regimes and sentencing provisions of nine environmental acts and introduces new enforcement tools. The combined effect of these measures is to help achieve greater compliance with Canadian federal environmental legislation. At this time, there are two methods used to change the way business interacts with the environment: the traditional regulatory command-and-control approach, and economic incentives or market-based policies. Not surprisingly, the latter has yielded the best results so far with its two programs: Emission Reduction Credits (ERCs) that allows polluters to earn credits by reducing emissions below their specified rate, and Capped Allowance Systems that set a maximum allowable cap on total emissions equal to the total number of allowances or permits allocated to a group of polluters. Although both programs have their detractors, market-based incentives have encouraged the private sector to include pollution abatement into production or consumption decisions. Certification programs like Energy Star have also helped to encourage the building and construction sector to take into account the impact of its actions on the environment. Established by the EPA in 1992, Energy Star has become the government-backed symbol for energy efficiency and is now a simple, credible, and unbiased source of information that consumers and businesses rely on to make well-informed decisions. Its results are impressive—Energy Star and its partners, including more than 40% of Fortune 500 companies, have helped save American families and businesses $430 billion on their energy bills. They have also achieved broad emissions reductions—preventing 2.8 billion metric tons of greenhouse gas emissions between 1992 to 2015. In addition, thousands of businesses and organizations look to Energy Star for guidance on strategic energy management, while top-performing buildings and plants that earn the Energy Star have been shown to command an additional 16% on sales prices and rental rates. LEED, or Leadership in Energy and Environmental Design, is the most widely used green building rating system in the world. Created by the US Green Building Council in 2000, the rating system is recognized as the international mark of excellence for green building in over 160 countries. The CaGBC, the LEED license holder for Canada, has certified over 2,800 LEED buildings in Canada and registered over 5,000 since 2004. This year, the CaGBC won the Clean50 Top Project Award for creating Canada’s first Zero Carbon Building Standard. Its aim is to help the Canadian real estate industry meet its obligations to limit climate change under the Paris Agreement. The standard sets out clear ways of assessing progress against the objective of eliminating GHGs from building operations and is already informing the work of others, including different levels of government. What is clear as we head into 2018, is that the pressure the construction industry faces, as well as its challenges and rewards, will accelerate exponentially in years to come. They will be driven largely by climate change events that are affecting an increasing number of regions and communities. Preventing pollution on our construction sites and in our built environment is no longer a niche market; it is the future and the future is now. 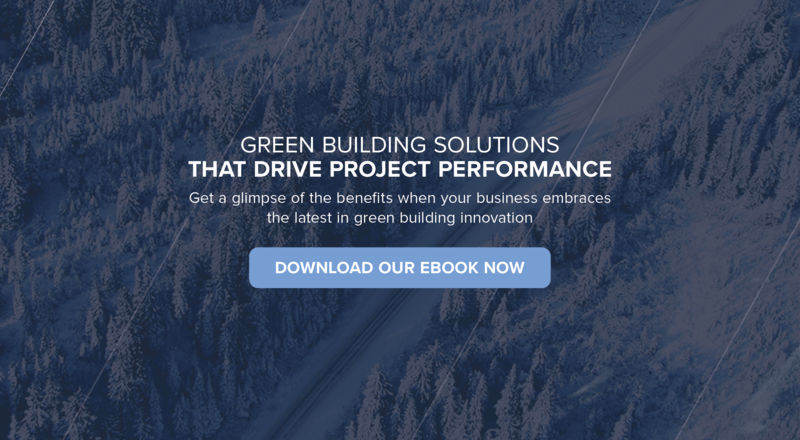 If you found this blog interesting, download The Race for Green Building Solutions Heats Up for insights into the building trends most likely to impact your business in the next 12 months, as well as the benefits to your business of embracing the latest in green building innovation. Green Certifications: A Benefit To Business Or Just Hot Air?